The genesis of this 'opera' performance piece came through a chance encounter with Mathew and Paige Dugdale at a celebration dinner that they gave for me and my friends, after the Private View of my show, 'Limber Gym' at Daniel Pryde-Jarmans' 'Meter room' gallery in Coventry. When we were called to dinner Bruce Mclean made a proposal that we should create a grand opera involving the dinner gong. Mathew greeted the suggestion with such great enthusiasm and certain requests that there was no way of passing up such a project for a performance in a perfect venue. 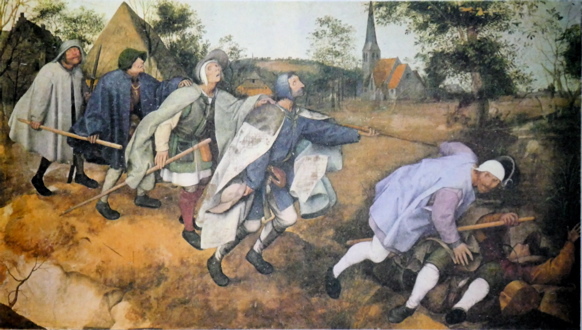 Bruce was keen on doing something based on 'The Studio' by Gustav Courbet and I thought that my own interest in the painting 'The Blind leading the Blind' by Breughel also appealed to Bruce and, for me, had an amusing connection with the Courbet painting that had always been of interest to me for a multitude of reasons. When Sam Belinfante became involved he suggested that we look at the work 'Memoirs of the Blind' by Jacques Derrida. I used this text to extract fragments in sequence that I thought of as stage directions that gave no intimation of anything at all philosophical or intellectual. These fragments became the libretto and the basis for creating 'The Score' for the performance. 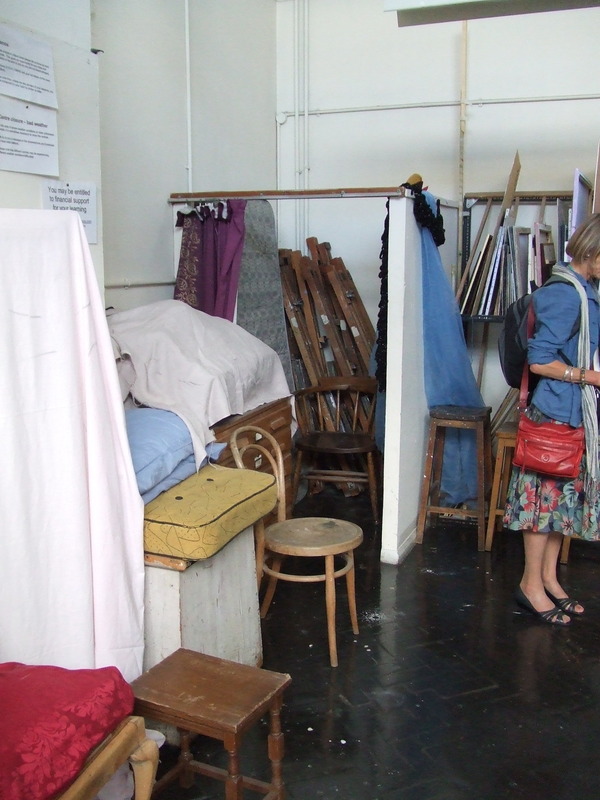 'The Changing Room' is a collaborative work initiated by Bruce McLean and Lawrence Preece. 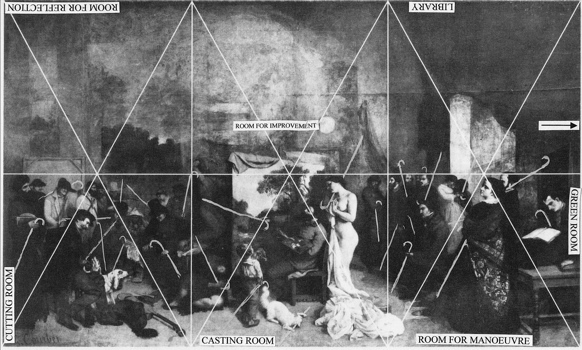 It is an 'Opera� based on the sensate, visual, political and metaphysical aspects inherent in Courbet�s painting 'The Painters Studio', conflated with Breughel�s 'The Blind Leading the Blind' and a photograph of a models' changing room in an English Art School. Through the deconstruction and collision of these historical works we developed a series of drawings that addressed the perennial artistic dilemma; how to recognise and represent what is heard and not heard and what is seen and, significantly, what is invisible. The libretto is derived from Jacques Derrida�s �Memoirs of the Blind� where the philosopher similarly explores issues of vision, blindness and self-representation, particularly in relationship to drawing. We �saw� these amassing drawings as graphic scores to be interpreted by performers in a series of guided improvisations. Financial support from The Elephant Trust allowed us to work intensively with experienced musicians in a makeshift set of projectors and temporary screens. We were kindly granted access to Merevale House in order to rehearse and perform the work and gave us an appropriately grand context in which to develop the work. Musicians and composers Lore Lixenberg, Adam de la Cour, Sam Belinfante and Neil Luck comprised a group of musicians who Bruce McLean had worked with independently on numerous occasions including performances at Ikon Gallery, Birmingham (2013), Cooper Gallery, Dundee (2011) and Test Bed, London (2010). We saw this as an opportunity to bring these incredible musicians together in a more developed and ambitious work of theatre. The scenographer David Barnett enabled us all to work together using a series of video projections deploying the scores together with an archive of video, drawings and photography to interact with the performers and singers and create a performance specific to the site in Merevale Hall. We are very grateful to Mathew and Paige Dugdale for giving us this great opportunity to develop this work in such an appropriate venue.